Victorian Lt Jack Duffy served with the 8th Battalion AIF at Gallipoli from 25th April 1915 until the December evacuation. His photograph album bears stark witness to that great endeavour because it includes dozens of photos of his comrades' original 1915 crosses and graves that were soon lost to time. 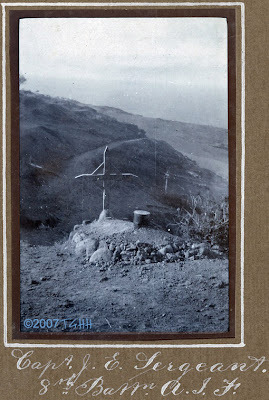 To the memory of all the fighting forces at Gallipoli, but in particular the Anzacs, these images from his album of original crosses, inscriptions, cemeteries, as well as of his mates are offered. Jack Duffy has four photos of this grave in various parts of his album. This grave commemorates Capt John E Sergeant who commanded B Coy 8th Battalion AIF at the Gallipoli landing on 25 April 1915. He was killed that day leading his troops onto Pine Ridge, aged 45. He is buried in Shell Green Cemetery. Below are the other three images of this grave in its dramatic setting. 4. Some of the first to Fall. I'm an architect. I was born in Australia but have lived and worked in London for almost 40 years. So I guess I am hooked on this great city. I've just re-written and re-published my revised and expanded "The Sky Their Battlefield 2" published by Fetubi Books, in 2014. It deals in great detail with the air war between 1914 - 1918, concentrating on the Allied air casualties and examining air activity on every day in every theatre of the conflict. It indexes and tells the stories of almost 17,000 Allied air personnel. It also links over 3,000 German air records to Allied events, and puts the air war into greater context with the ground war. Go and look at www.theskytheirbattlefield2.com to see more details! It's the result of over 30 years' hard work! Naturally I also have a wider interest in the military history of the Great War and I found Jack Duffy's amazing album in the 1990s in a shop in Melbourne. Its importance was immediately obvious and it was only a matter of technology and finding the time to start it that led to this blog.